Whether it is watching or playing it we can't seem to get enough of it. One of the passions of the Merington family is following the Collingwood Football Club. The Mighty Magpies. Our family have been supporting the Magpies for over 100 years. 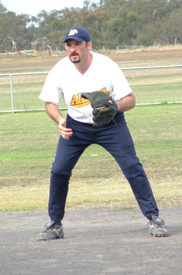 I play softball for the Altona Softball Club and the Baldwin Bandits Masters team. Our team the Bandits are the current Victorian 'B' grade State Masters Champions and Australasian Masters silver medalists. Jack also plays softball with the Altona Softball Club. He also plays basketball with the Heathdale Hornets and has just started to play indoor soccer. Olivia and Hannah haven't chosen a sport yet, but it will be anytime soon. I also closely follow the New York Yankees baseball team. I love the history and the game of baseball. One day I will get to visit the great Yankee Stadium and catch a game or two there. As well as the Yankees I keep an eye out for Australians playing in the Majors.